Friction welding has been doing near net shape manufacturing for decades. Near net shape manufacturing is the process of machining several smaller parts that form a larger part. It is possible to machine the larger part out of a solid block or bar of material. However, the process of machining that part can require a lot of unnecessary work and wasted materials. The simpler, more effective method, is to machine smaller, individual near net parts and then friction weld them together to form a shape that is much closer to the final part and requires very little machining to complete it. For example, a lift screw can be made by friction welding a threaded rod to a flange rather than machining the entire screw out of a solid bar of metal which is time consuming and produces a lot of waste. Friction welding this part is a faster alternative and a much more efficient use of material. 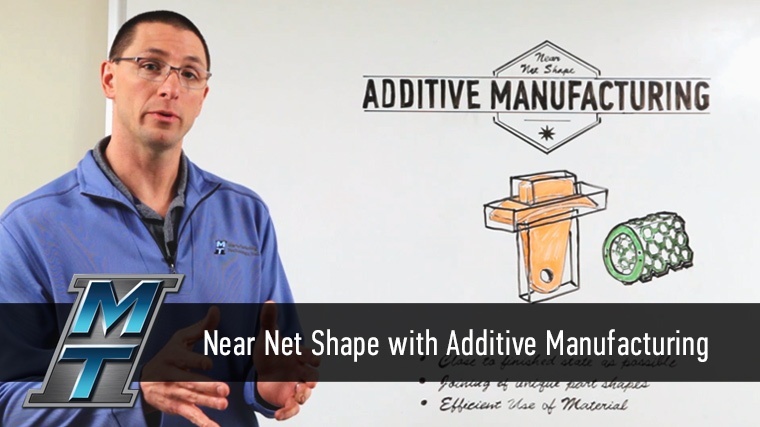 The ultimate in near net shape manufacturing is the additive manufacturing process, also known as 3D printing. Here, powdered material is fusion welded together, layer by layer, joining individual grains of material to build a lattice structure. Large parts can be 3D printed, however, it is very time consuming and expensive. It is much more efficient to 3D print a smaller part, including a weld interface on the printed part, which can then be friction welded to another larger, standard structure. MTI has successfully demonstrated the ability to weld additively manufactured parts to standard materials with the resulting structure maintaining very strong material properties. MTI has used the friction welding processs for near net shape manufacturing of parts since the start and has now proven the ability to produce quality parts by friction welding with additively manufactured parts. With these techniques among the several friction welding options applied by our expert engineers every day, MTI has the knowledge and know how to solve your manufacturing problems. We’ll build a machine that makes your part, we’ll make the part for you, or we’ll help you make the part even better. To learn more about friction welding, visit our website or watch how friction welding can be put to work for you.